For some reason, the mail came early. I saw the mail truck pass by our mailbox around noon, so I headed outside to collect it. I noticed a few envelopes with actual handwriting on the front, indicative of a more personal message. 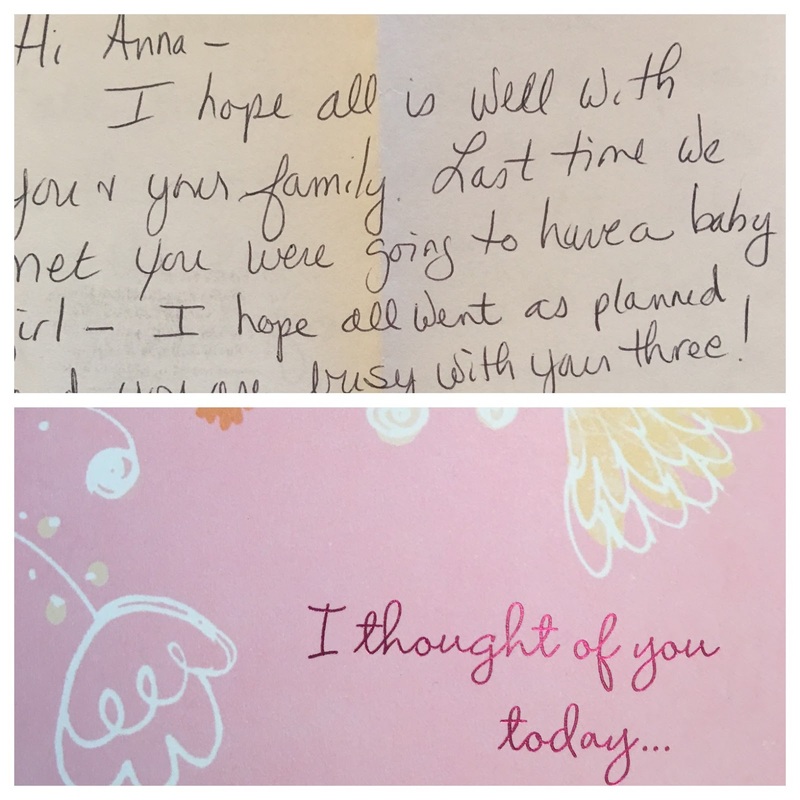 We have no upcoming birthdays in this house, and handwritten notes are few and far between so I was intrigued. I thought that I had encountered everyone who knew of our losses and I was not going to have any more moments like this. I completely froze. I sat down and let a tear roll down my cheek. She only knew about my pregnancy with Nelle – July of last year. She didn’t even know of my subsequent pregnancy with Iris. I remember being in her office, 17 weeks pregnant, wearing a rather oversized shirt. When I told her how far along I was, she commented “you’re so tiny!” I laughed, saying it was the combination of the shirt and that I was in better shape than I had been in previous pregnancies. I certainly didn’t feel tiny. About two weeks later, we found out that Nelle was growth restricted. Now I need to email her a follow-up to schedule a time to discuss our finances for the year. And tell her that we lost our baby. Whether I get into the rest of the story, I don’t know. It is that awkward feeling with people that I’m not close too – wanting to honor the stories of both of my daughters, but not wanting to make the other person uncomfortable with the tragedy of it all. I opened the second envelope. A card. Sent by friends, with the simple message “I thought of you today.” No particular reason, just letting me know that they were thinking of me. The universe was looking out for me, having that card arrive on the same day as the other note.